The saying goes...be careful what you wish for, and for this little lady, nothing could ring truer! Let's be honest, we've all been there - that moment when you think all your dreams are about to come true, only to have them shattered in the most extreme way possible! Well it turns out that this little tot is just the same as the rest of us and will certainly be learning the life lessons of regret early on, bless her. 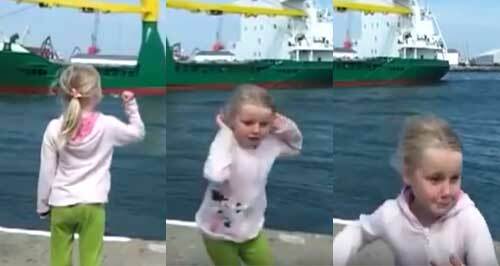 Our hearts reach out to the sweet child as she begs for a big ship to toot it's horn in a friendly 'hello' to her. However, when she finally gets her heart's desire, the poor kid instantly regrets it! The priceless look on her face when the boat loudly honks it's horns in response to her request is absolutely priceless. We reckon a lifelong phobia of boats might be the result of this little incident...poor mite!